Isoetes eludens J.P.Roux, Hopper & Rhian J.Sm. Quillworts are known from fossils more than 150 million years old and show similarities to the extinct fossil tree Lepidendron, which dominated during the Carboniferous period. Today, there are approximately 150 known species, distributed on all continents except Antarctica. South Africa, Northern Province, S. D. Hopper & R. J. Smith RJS114 (holotypus K; isotypus NBG). Vegetation at the type locality consists of woody scrub that has been classified as Kamiesberg Granite Fynbos (Rebeloet al. 2006). 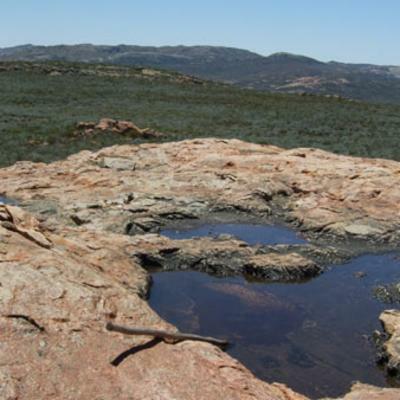 The plants of Isoeteseludens occur in a single undisturbed !gau in Kamiesberg gneiss at an altitude of 1,284 m. The !gau is approximately 2 m in diameter, forming a shallow pan-gnamma. It is situated on the spine of a ridge that does not allow drainage into the pool from higher terrain. Aeoline detritus forms a thin layer at the pool bottom, which also supports a single LimosellaafricanaGlück (Scrophulariaceae) plant and a large population of a Nostoc (Cyanobacteria: Nostocaceae) species. The I. eludens population in the pool consists of approximately 250 to 300 plants and grows in clear water 100 – 150 mm deep. The current IUCN (2001) classification recommended is Vulnerable (VU D1 & 2). The plants, although known from a single locality only, are not threatened by farming activities as vegetation in the vicinity of the site largely consists of unpalatable woody Kamiesberg granite fynbos and lithophyticherbfields not suitable for sheep farming. The site is also far from any other human activities that may impact on the population. However, clearly, the species would be critically endangered if the sole !gau in which it is known was its only location. It would take just one eutrophication event through deposition of animal dung, for example, to alter hydrological conditions sufficiently to threaten this population. Urgent further surveys are needed to establish the geographical extent and conservation status of this remarkable local endemic. The specific epithet is derived from eludo = avoid, evade, frustrate or baffle, referring to the species eluding searches over several years for Isoetes on flat-topped inselbergs and granite mountains in Namaqualand by the junior authors and others. The location of Isoeteseludens in the Kamiesberg not only extends the known distribution of the genus in South Africa significantly, but it also underpins the Kamiesberg as a centre of endemism. I. toximontana Musselman & J. P. Roux was also recorded from a seepage area near the type locality of I. eludens. No scales (arrested sporophylls) or phyllopodia have been observed in Isoeteseludens. This is contrary to the observations of Duthie (1929) and Hickey (1986) who found these structures to be present in virtually all the species subject to periods of drought-associated dormancy. Scales may, however, be formed during seasons when rains are more sporadic and when the plants are subject to fluctuating wet and dry spells. The root-hair cells are generally very long and variously thickened at the point of attachment between two cells. 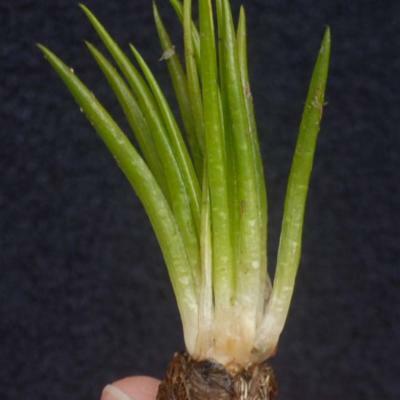 The root hairs appear not to arise on idioblasts as in some Isoetes species. The dorsolateral alae are generally less than 0.5 mm wide at the base, but gradually taper higher up and mostly disappear 12 mm or less from the sporophyll base. In cross section the sporophylls show no peripheral fibrous bundles, a feature typical of some obligate submerged aquatic Isoetes species (Hickey 1986). Part of an ancient group of plants related to the ferns, this species eluded discovery until 2007, hence its Latin name eludens. Quillworts are known from fossils more than 150 million years old and show similarities to the extinct fossil tree Lepidendron, which dominated during the Carboniferous period. At this time, before flowering plants had evolved, quillworts were much more common. Today, there are approximately 150 known species, distributed on all continents except Antarctica. Most occupy permanent lakes and bogs, but several of the rarest, like Isoetes eludens, occupy temporary pools. They are heterosporous, that is producing two different types of spores, and can survive dry periods in a dormant phase as resting spores, or as perennial stems or corms submerged in mud. Isoetes eludens is a very small plant in a vast landscape. 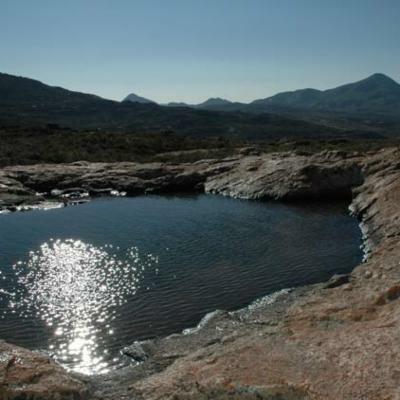 Only 6 cm tall and known from only one location, it is dwarfed by the dramatic landscape of the granite mountains that surround its rock pool home. Nevertheless its adaptation to this habitat has given it remarkable resilience and while it was only discovered as recently as 2007 it is likely to have survived in this region for millions of years. Isoetes eludens is restricted to the Kamiesberg Mountains in Namaqualand, South Africa. It is known to occur in only one rock pool in this region but further surveys may result in additional locations being found. 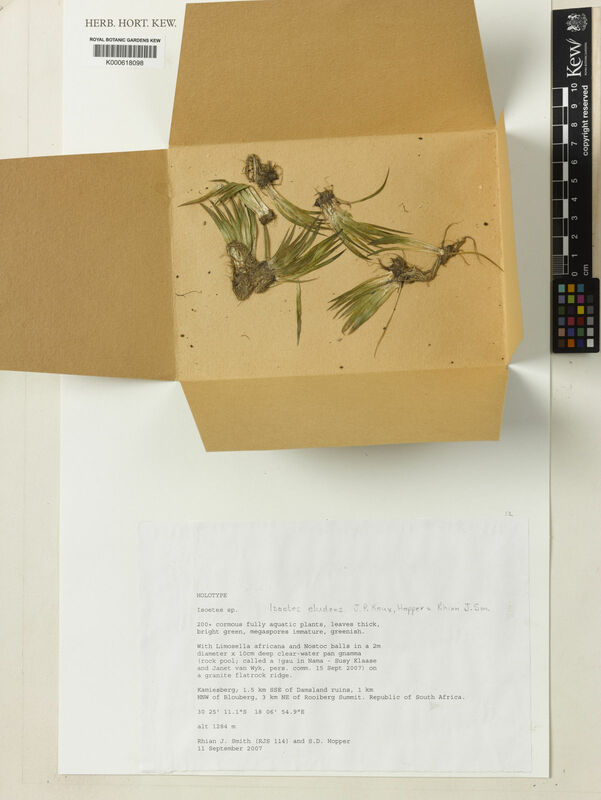 Isoetes eludens was collected for the first time in 2007 by the then Director of Kew, Professor Stephen Hopper, and his Postdoctoral Research Fellow, Dr Rhian Smith, during an expedition to the Kamiesberg Mountains in Namaqualand, South Africa. Professor Hopper and Dr Smith were about to descend the mountain at the end of a long day but at the last minute decided to climb onto one more ridge, as Professor Hopper had a hunch there may be some interesting gnammas (temporary rock pools, known by the local Nama people as !gau) there. 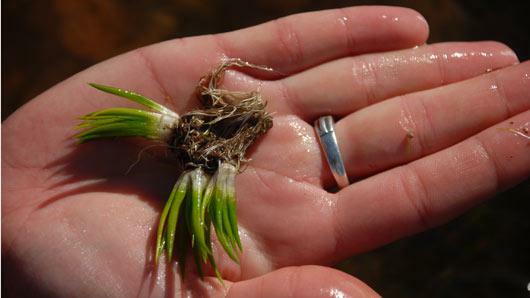 His hunch was correct and the granite ridge contained a depression filled with water and a number of plants that were instantly recognisable as a type of quillwort. However, a closer look at the plant told him that this was something new and exciting. Specimens were collected, along with some material for DNA analysis, and taken to Dr Koos Roux, Curator of the Compton Herbarium at the Kirstenbosch National Botanical Garden in Cape Town (part of the South African National Biodiversity Institute). Dr Roux is an expert in this group of plants and confirmed that the Kew botanists had indeed discovered a new species of Isoetes . He then went on to provide a formal botanical description of the new species and this is published jointly with Professor Hopper and Dr Smith in an edition of the scientific journal Kew Bulletin . Despite further searches by Professor Hopper and Dr Smith in 2008, the species has only been confirmed from one gnamma. Although this may in fact be the only location for the species, botanists at Kew are hopeful that further discoveries will be made now that the species has been formally described. Planned future collaborative work with botanists at the Compton Herbarium, Cape Town includes producing a phylogenetic tree (reflecting the evolutionary relationships among groups of organisms) of this ancient plant family. 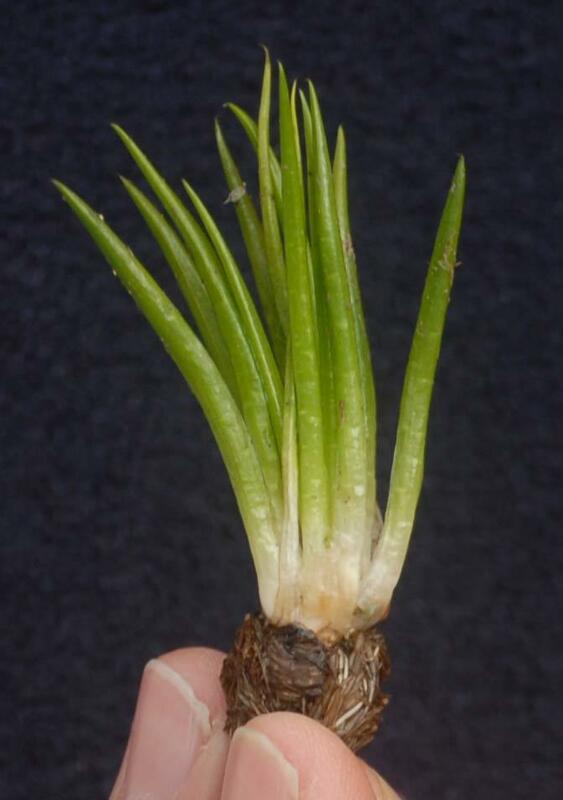 Isoetes eludens has long simple roots with widely spaced root hairs, penetrating to 5 mm below the soil surface. These are borne along the lobes and grooves at the base of the stem, which is strongly 3-lobed and approximately 4 mm tall. The main above-ground part of the plant is formed from up to twelve green sporophylls (leaves that bear spore-producing structures) with white bases, up to 52 mm long. The sporophylls form a tightly clustered rosette and are hollow and quill-like, giving rise to the common name of quillwort. The sporangium (spore-producing structure) is embedded in the base of the sporophyll and produces either megaspores (large spores that will develop into a female egg-producing structure) or microspores (small spores that will develop into the male sperm-producing structure). Megasporangia are borne on the outer sporophylls while microsporangia are borne on the inner sporophylls. The presence of a protective sac around the sporangium is one feature that sets this species apart from other members of the genus in South Africa. The type specimen of Isoetes eludens (the reference specimen from which the name is taken) can be seen in Kew's Herbarium (one of the behind-the-scenes areas of Kew, accessible only to bona fide researchers). Duplicates can also be found in the Compton Herbarium of the South African National Biodiversity Institute in Kirstenbosch Botanic Gardens, Cape Town. The current IUCN (2001) classification recommended for this species is Vulnerable (VU D1 & 2). The plants, although known only from a single locality, are not threatened by farming activities, as vegetation in the vicinity of the site largely consists of unpalatable woody Kamiesberg granite fynbos and lithophytic herbfields not suitable for sheep farming. The site is also far from any other human activities that may impact on the population. However, clearly, the species would be critically endangered if the sole !gau (seasonal rock pool) in which it is known was its only location. It would take just one eutrophication event through deposition of animal dung, for example, to alter hydrological conditions sufficiently to threaten this population. Although the remote !gau habitat of Isoetes eludens is not at risk from human encroachment it may face a larger threat from climate change. 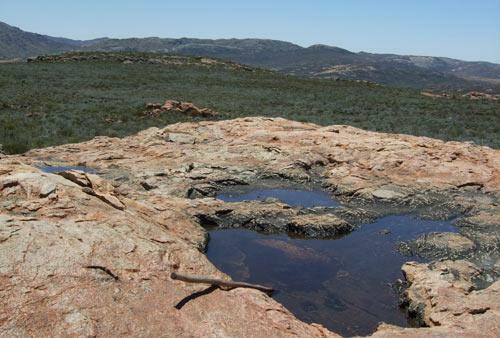 Exposed temporary pools are vulnerable to changes in climate, such as decreased rainfall, and as the Isoetes eludens !gau is the only confirmed location for the species it is particularly vulnerable. 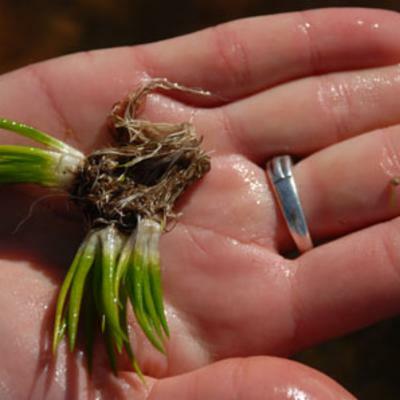 However, persistence in small microhabitats that serve as refuges during climate change may have occurred frequently in the past and this quillwort may have survived previous fluctuations in climate in this locality. There may be other as yet undiscovered populations in the Kamiesberg and urgent further surveys are therefore needed to establish the geographical extent and conservation status of this remarkable local endemic. Collecting the spores of Isoetes eludens , and arranging their long-term storage in seed banks, will be an important next step to securing the conservation of this intriguing species of an ancient lineage. 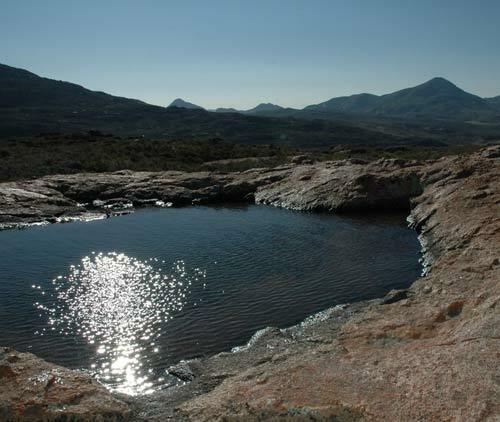 Seasonal rock pool on granite gneiss, at 1,284 m above sea level, in the Kamiesberg Mountains, Namaqualand, South Africa. Recommended IUCN rating is Vulnerable (VU D1 & 2). IUCN (2001). IUCN Red List of Threatened Species. 2001 Categories & Criteria (version 3.1). http://www.iucnredlist.org/info/categories_criteria2001. Roux, J.P., Hopper, S.D. & Smith, R.J. (2009). Isoetes eludens (Isoetaceae), a new endemic species from the Kamiesberg, Northern Cape, South Africa. Kew Bulletin 64: 123-128.